Head to the info booth starting in June to pick up your farm-fresh recipe box! Recipe Baskets are currently available for pick-up at the market on Sundaysfrom 10am-2pm (as supplies last). Subscription Recipe Basket . . . Sliding scale pricing! Click to learn more. Rail Yards Recipes is an innovative program that makes eating fresh, healthy, and local food easy and fun! Each plentiful basket includes a colorful recipe with seasonal and fresh ingredients from small local farms and businesses from the middle Rio Grande Valley, with an emphasis on products from Rail Yards Market vendors. A detailed instructions card features educational information on how to use cooking equipment, information on farms and vendors who supply products, easy-to-follow verbal and visual steps make cooking the meal easy even for the most inexperienced chef-to-be. Ingredients are pre-portioned, and recipes are designed to create a hearty and healthy meal for two. 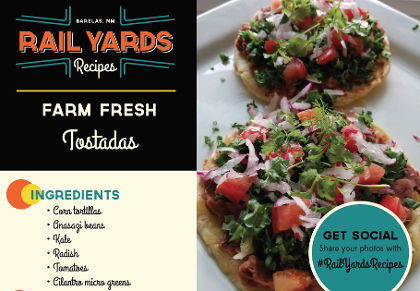 Eating local is easy and affordable with Rail Yards Recipes! Each basket is priced on a sliding scale model; our goal is to increase access to local and fresh ingredients, so we offer discount pricing for multiple baskets for families and low-income and EBT customers.